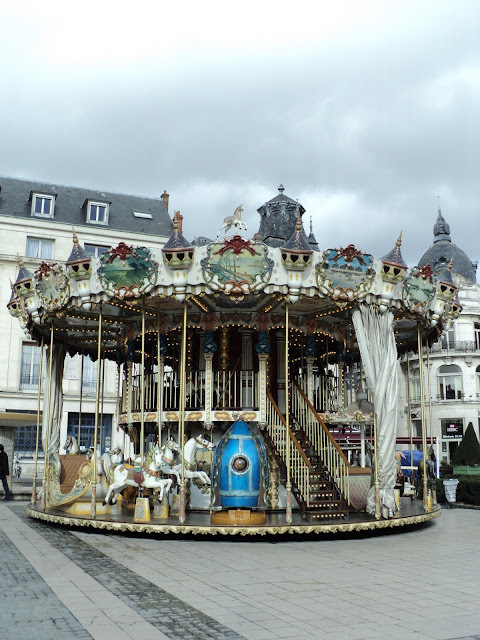 When we first moved to the Orléans area, I took the kids on this beautiful carousel every time we visited the city. This 90-year-old manège is a classic attraction in Place du Martroi, in the middle of town. In the beginning, I had to help them choose an appropriate ride for their size, help them climb up, ride alongside them... Oh, the choices! The airplane with The Little Prince? The Jules Verne Submarine? Something on the second level? Way up high? Later, when they were bigger, they just grabbed their tickets from me and off they went. Then on a recent trip, Alex decided it wasn't for him anymore. "I'm too old, mom." We'll see. They've got a young cousin coming soon. We're planning a trip to the city. Alex or Ellie might need to help the little guy choose an appropriate ride, help him climb up, and stand by his side while he rides. And I'm sure they wont mind the ride.